I stopped making New Year’s resolutions a while ago. They never last, and they are just a huge source of frustration. Think about it. What was your resolution last year? Did you keep it? Did you lose weight, start exercising, spend less, save more? There are lots of industries that count on you NOT keeping your resolution. The fitness industry charges an annual membership fee but lots of gym members stop going after 4-6 weeks (if that). Failure is very lucrative for the weight loss industry, right? Behavior change is incredibly hard. Why set yourself up for failure? Use these 4 suggestion to set a goal that IS doable for you! A year is too long for a meaningful goal. Chop that goal up into manageable, bite-sized chunks. Remember, how do you eat an elephant? One bite at a time! It is fine to say “I want to lose 30 pounds by next Christmas”. However, that is a HUGE goal and it would be easy to procrastinate. Set a 1-month and 3-month goal so you can keep the finish line in sight and stay motivated. Make sure before you set a specific, short-term goal that it’s something you can ACTUALLY do. If you have chronic foot and ankle pain, committing to run a marathon in the spring might not be realistic. Do you have the finances to eat all-organic? Can you commit the time to cook all your meals at home? Or would it be better to commit to choose grilled rather than fried foods and vegetables rather than starchy sides when eating at restaurants? This isn’t to say you shouldn’t set aggressive goals. I’m all for shooting for the moon! Even if you don’t quite make it, you’ll still have made huge progress, right? It’s all about balance, though. If your goal is too aggressive you might get frustrated and give up. Part of making your goal specific is making it measurable. Betty Rocker recommended we take a calendar or white-board and put a big X through each day as we complete our daily workout. Seeing measurable progress is a great motivator! If you have a weight loss goal make sure to NOT have all your measuring happen on the scale. Take your tape measure and write down your inches because in those plateau periods where you’re not seeing progress on the scale, often your clothes will be fitting differently and you can see progress in your inches instead. I don’t believe in New Year’s resolutions anymore because I’ve seen too many people (myself included) set resolutions and fail to keep them. Instead I set measurable, realistic, specific short-term goals and do my best to knock them out of the park! QUESTION: What specific, measurable, realistic short-term goal will you set for yourself for the next 1 to 3 months? Comment and tell me about it! Is This Year’s Flu Shot Less Effective? The short answer is yes, unfortunately. Before the conspiracy theorists and anti-vaccine folks ramp up, though, I’d like to explain in a little more depth. The vaccine is not INeffective, mind you, it still gives some protection against the flu. However, this year’s dominant type-A flu strain is the H3N2 variety, and the flu vaccine is not as effective against this flu strain. Even if the flu vaccine is a perfect match for a given year’s outbreak, this strain mutates very rapidly and can quickly change so that it evades the immune system. Also, there seem to be two influenza B strains circulating. If you got the quadrivalent (4-strain) vaccine, both type-B strains should be included. If you got the trivalent (3-strain) vaccine, only one type-B strain will be covered. One cool new development this year is that, for the first time, in one of the available vaccines the H3N2 component virus was grown in a cell culture rather than in eggs. H3N2 doesn’t grow well in chicken eggs, and the antigens shift a little while growing in eggs. This also makes it harder to get a good crop of virus and interferes with the effectiveness of H3N2 strain influenza vaccines. While there isn’t any data (yet!) about whether cell-culture-produced vaccine virus is more effective than virus grown in eggs, they are watching carefully and research is ongoing to discover whether this method is better than growing virus in eggs. One major benefit to using cell culture rather than eggs is that the virus can be grown much more quickly, and vaccine can be produced without having to decide 6 months in advance which strains to include. If you haven’t had your flu vaccine, you should consider getting vaccinated ASAP. Vaccine will continue to be administered. Even though flu is here, new cases will continue to develop for several more weeks. If you have a chicken egg allergy, you should NOT automatically avoid vaccination. Hives from chicken eggs is not a reason to avoid the vaccine. If you have had anaphylaxis, angioedema or breathing problems with past vaccinations you can still be vaccinated but it should be done in an allergist’s office where they are prepared to handle possible severe allergic reactions. Whether or not you’ve been vaccinated, you should take steps to protect yourself from influenza. Wash your hands regularly. Get plenty of sleep, drink plenty of water and take your vitamins. Consider giving a fist-bump instead of shaking hands when you meet someone new. If you develop a fever, body aches, headache and a cough which comes on suddenly, STAY HOME. Do NOT go to work or visit with friends or family. If symptoms are reasonably well controlled with OTC meds it may not be necessary to see the doctor. Most healthy young people handle influenza without much trouble. If you are short of breath, feel dizzy, pass out, have chest pain or symptoms last longer than 7-10 days, definitely contact your doctor. It is estimated that we need to vaccinate 30-40 people to prevent one case of influenza in any given year. This year the number needed to treat (NNT) is probably a little higher, but it’s still much better than other vaccines. As I wrote not long ago, the brand new Shingrix vaccine has a NNT of 99 patients per case of shingles in 1000 person-years, and with Zostavax it was 435 patients. Flu is here. And while the flu vaccine is not as effective as we would like it to be, it is still worth getting. QUESTION: Did you get your flu shot? (I did!) Are you happy you did? Do You Need An EKG? Would it surprise you to know that sometimes I refuse to do what my doctor wants? It shouldn’t – doctors are people too, and we have opinions that may differ from each other. At my annual physical yesterday, the medical assistant explained that my doctor likes to do EKGs on all her adult patients when they have physicals. I declined and I’ll tell you why. Do you need an EKG? Currently it is NOT recommended by the United States Preventive Services Task Force OR the American Academy of Family Practice to do routine EKGs. That means that unless you have symptoms of heart problems (chest pain, dizziness, fainting, heart palpitations, etc) or risk factors for heart problems (high blood pressure, high cholesterol, diabetes or a strong family history of heart disease) you do NOT need an EKG. Some people would say, “Dr. Jen, what’s the harm in getting an EKG? It doesn’t hurt, it’s not invasive, it’s simple and inexpensive and can be done right in my doctor’s office.” While that’s correct, you have to remember that no test is perfect. Even a simple test like an EKG can have what’s called a false-positive result. That means the test result is abnormal, even though nothing is wrong. If a person is very unlikely to have the problem that we’re looking for, then positive results are more likely to be false-positive than truly abnormal. And remember, the next test done for a patient with an abnormal EKG (to find out whether it’s a false positive or not) is a stress test. That’s a much more expensive test that still has a risk of false-positive results. Remember what I said before, no test is perfect! If your doctor wants to do tests, it is important that you understand why they are recommended, what problems the doctor is looking for, and what the next test would be if the test is abnormal. Want to see what the current recommendations are? There are two commonly used places to look. The United States Preventive Services Task Force is a government agency that examines the research and makes recommendations about what preventive services people should have at different ages and stages of life. This agency is important because in some respects their recommendations are used to determine whether testing is covered by Medicare, Medicaid and commercial insurance companies. You can click the USPSTF link above to check current recommendations. My professional organization is the American Academy of Family Practice. For the most part, the AAFP follows the USPSTF, but not always. Sometimes the AAFP doesn’t agree. You can see the American Academy of Family Practice’s recommendations at the link above. Every doctor is responsible for keeping up on the current recommendations. In fact, a lot of our continuing medical education is focused on the changing world of screening tests. As more and more research is done and published, testing recommendations will continue to change. It is confusing for patients when screening recommendations change, but that’s what doctors are for! Doctors have to explain these changes and the reasons for them to patients so they understand. We want to do the right tests for each patient to keep them healthy. We have to look for problems that need to be diagnosed and treated early. Doctors should also avoid spending health care dollars on tests that don’t contribute to meeting these goals. QUESTION: Does your doctor do routine EKGs for you when you have your physical? Will you talk to him or her about this topic when you go in next time? This week I did something new – I was invited to be a guest on my friend’s internet radio show. She is a runner, and we talked about a number of things related to that topic. Please click this link to check out the podcast! What do penguins have to do with running? QUESTION: Do you want to hear me do more podcasts? Do you like video blogs? Or do you prefer text (written) blogs? One of my patients was in the office this weekend and she was so mad about the price she was charged for a medication I prescribed. I was flabbergasted because it is a generic med, not brand, which usually means a less expensive drug. That’s when I realized she didn’t know how to check drug prices before going to the pharmacy. 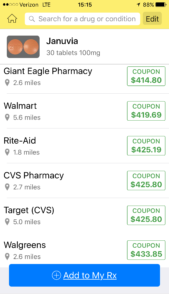 There is a website that gathers drug prices from different pharmacies and puts them at your fingertips, like Priceline does for airline tickets and hotel rooms. This website is GoodRx.com. There’s an app as well so this info is never farther than your phone! 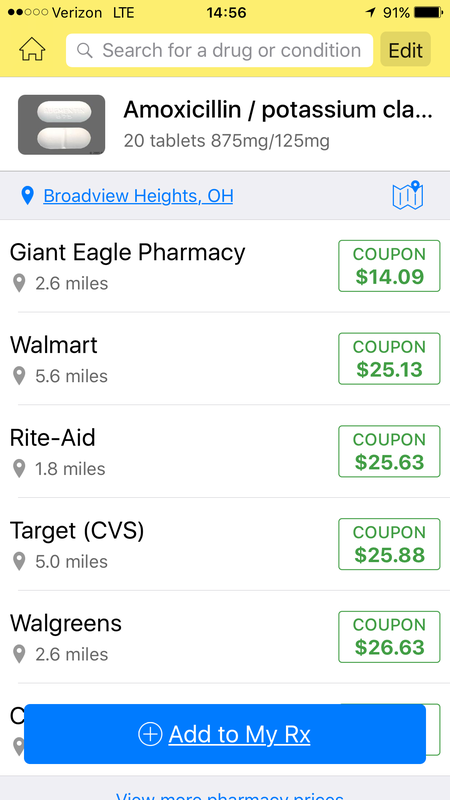 GoodRx.com also provides information about drug coupons to decrease copay costs. 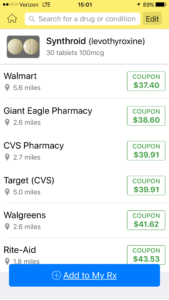 I try to make sure anyone who takes any brand-name medication knows about this website so they can choose their pharmacy based on the best medication price. Even those who have good prescription coverage should consider using this app. 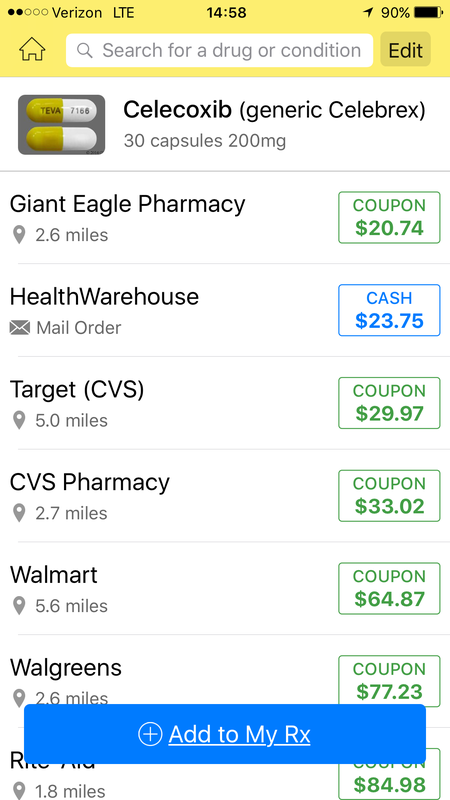 After all, drug costs paid by insurance companies are always passed on to subscribers. Nothing is free, so reducing drug costs to insurance companies will help keep premiums down in the long term. Here’s an example: The prescription antibiotic Augmentin (generic amoxicillin / potassium clavulanate) is commonly used to treat sinus infections. How much would it cost if you had no insurance? Depending on where you go, the price varies a bit. What if you choose something that went generic recently? Does generic really matter that much? Well let’s look at one that I discuss with patients fairly regularly, the thyroid medication Synthroid. 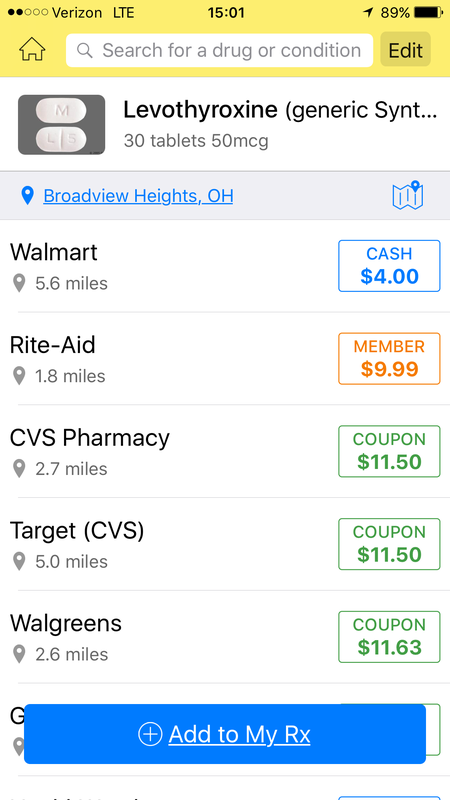 Is it really that much more expensive to get the brand medication? Here’s the generic, followed by the brand. And what about a medication that’s not available as a generic? Here’s the diabetes drug Januvia which has been around for awhile, but not long enough to be generic just yet. Huge difference, right? This is why I prescribe generic medications almost exclusively, and why insurance companies push back so hard on us for prescribing brand medications. 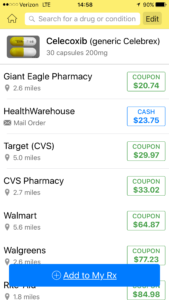 Drug prices are a huge part of our health care expenditure, and being aware of what your medications cost, asking for generic medications wherever possible, and choosing a pharmacy that has lower prices are all things each of us can do to keep health care costs down and insurance premiums more manageable. 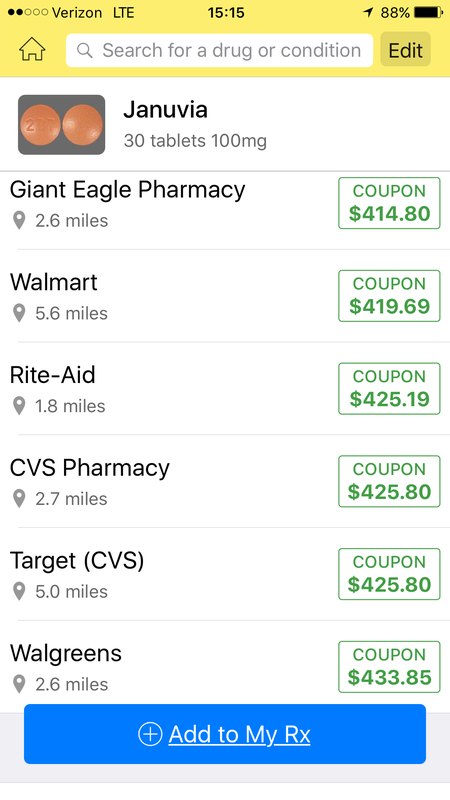 Please download the GoodRx app and use it to choose your pharmacy. Every little bit helps as far as cutting costs. The meds are the same, your treatment will be as effective whether you pay $4 per month or $12 per month. Multiplied by 300 million people in the US, that $8 per month difference really adds up. QUESTION: Did you know about this website? 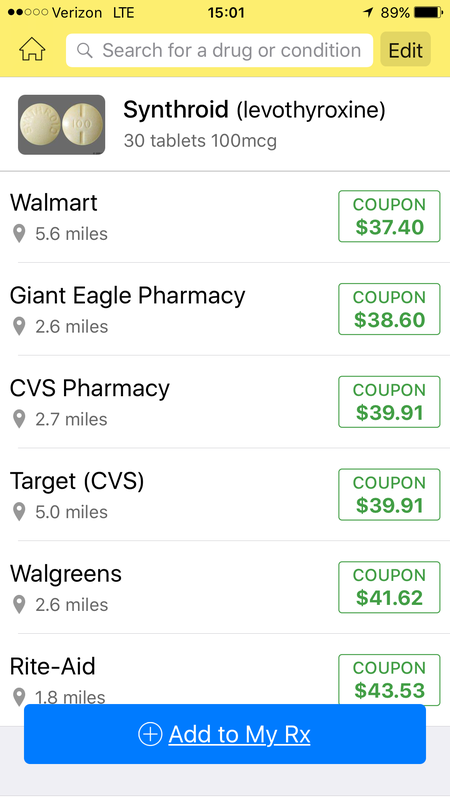 Will it change where you go to get your medications filled?